Synopsis: A group of Jewish American soldiers set out with the intention of killing Nazis in the heart of Nazi occupied France, all the while, a plot to assassinate Nazi High Command is being devised by a cinema owner with a tragic past. Review: The Second World War, a truly dark and troubling part of European History in the 20th century. The rise of Fascism and Communism and a continent that was seemingly on the brink of tearing itself to pieces. A period that has been the subject of many textbooks. Therefore presenting a perfect opportunity it would seem for writer and director Quentin Tarantino, a chance to make a fun and violent movie during the period that quite literally throws the history textbook out of the window, and shoot it a couple, or maybe ten times. 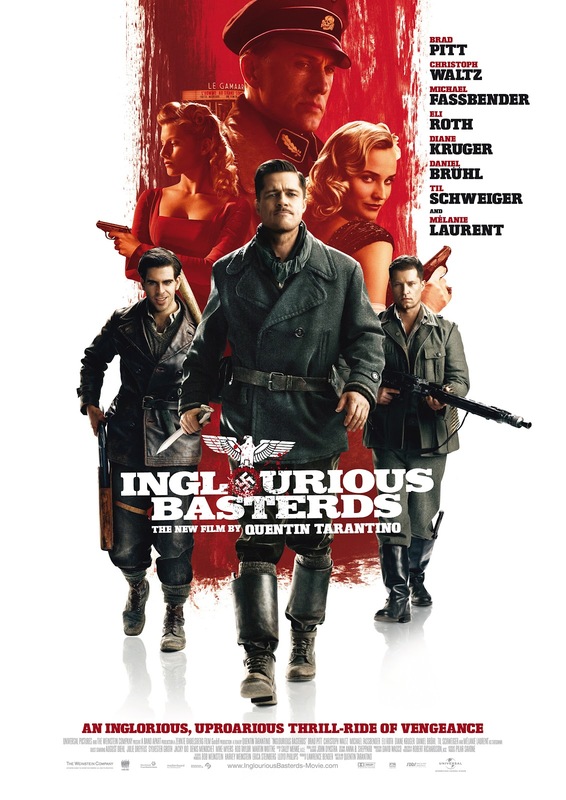 Set in 1944 with the war raging across the continent, enter the Basterds lead by Lt Aldo Raine (Pitt) a group of Allied soldiers who are killing Nazi soldiers with with a large amount of glee as they do. Meanwhile a cinema in Paris becomes the centre of a plot by the owner (Melanie Laurent) who is after one thing only, vengeance. The perfect ingredients for a three hour Tarantino flick filled with violence and superbly written dialogue and some truly memorable characters, and it sure is bloody entertaining stuff! With what is without doubt one of the finest opening scenes in cinema history, we meet Colonel Hans Landa, played wonderfully by Christoph Waltz who’s on his way to meet a farmer, about the whereabouts of some missing Jews. Although this conversation is initially warm and hospitable, it isn’t long before things go cold, unwelcoming and becoming all the more tense with each passing scene. On this scene alone, Waltz deserved the many accolades that came his way for this performance, including the Academy Award for Best Supporting Actor. Tarantino has created many memorable characters in his filmography, but Landa is right up there with the best of them. Laurent is also spectacular as the cinema owner, Tarantino knows how to make compelling female characters, and he does so yet again as both Shoshanna (Laurent) and Bridget (Kruger) are intriguing and well developed characters, the former more so than the latter though. Brad Pitt as the gruff Aldo Raine is also on spectacular form as the leader of the Basterds, with Michael Fassbender also lending his tremendous talents as a British Double Agent in what is a very talented cast. Tarantino is one of the finest writers and directors working in the industry, and there are more than a few scenes that are just flawless in terms of the writing, the actors performances and the execution of the scenes are all just exceptional. The aforementioned beginning sequence jumps to mind, but so too does the quite brilliant restaurant scene, which has potential to be one of the finest Mexican stand off scenes ever put to film. The tension is almost unbearable at some points. Whoever knew that a scene where two characters eat strudel could be so tense? This being a Tarantino flick means that there will be violence, and there is plenty of that indeed, and it’s glorious to watch. The script also manages to fuse a perfect amount of comedy in there as well, watching Pitt try and mask his thick American accent to masquerade as an Italian is just extremely entertaining. The length is often a gripe with some of Tarantino’s work, and yes at and at just over 2 and a half hours, Basterds is certainly a movie you need to sit down and invest your time in. Yet it’s a worthy investment when the climax is reached and the credits begin to roll. “This might just be my masterpiece,” says one character as the film reaches its conclusion. It almost feels as though that dialogue was from Tarantino himself direct to the audience, and on the evidence of this film, it is kind of hard to disagree with him. With exceptional writing, tremendous acting, and a bloody exciting story set in the heart of the Second World War. This is vintage Tarantino, and one of his best.